A substantial portion of Mr. LaChance’s practice consists of representing individuals, institutions and employers in defense of lawsuits. Mr. LaChance is also an instructor at Vermont Law School, where he teaches legal methods to first-year law students. Mr. LaChance served as a judicial intern for Chief Justice Paul Reiber of the Vermont Supreme Court. While studying at Vermont Law School, Mr. LaChance interned for the Addison County Prosecuting Attorney’s Office and the South Royalton Legal Clinic. 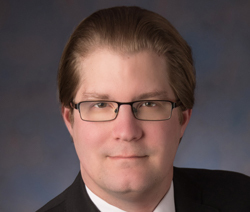 Mr. LaChance also served on the staff of the Vermont Law Review; coordinated the Volunteer Income Tax Assistance Center; and represented the law school at the Texas Young Lawyers Association’s Northeast Regional Trial Competition in 2016. In 2014-2015, Mr. LaChance was a Joan Loring Wing American Inns of Court fellow. A returned Peace Corps Volunteer, Mr. LaChance served three years in Burkina Faso (Sub-Saharan West Africa), where he helped a women’s group secure the first land title in the village’s history.